ConocoPhillips recently increased its dividend and yields 6%. 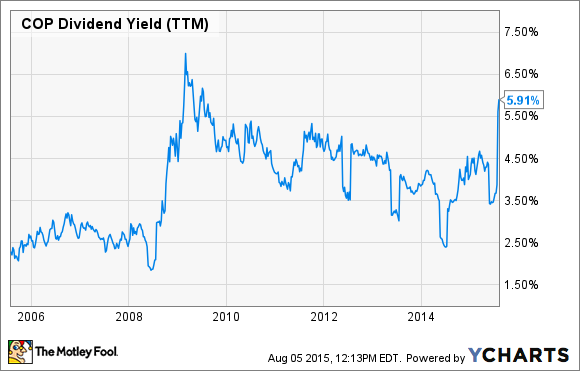 Here's why this high yield is secure. It's no secret that Big Oil is in big trouble. Oil stocks have gotten crushed in 2015, obviously because of the steep collapse in oil prices over the past year. In the United States, West Texas Intermediate crude is all the way down to $45 per barrel, a stark contrast from last year's $100 prices. Not surprisingly, Big Oil profits are declining significantly as well. This development has put dividends squarely in the cross-hairs of analysts and investors. With some oil companies posting big losses, investors are wondering whether the huge dividend yields across the sector are sustainable. While some companies have had to cut dividends to stay afloat, I believe ConocoPhillips (NYSE: COP) will be able to maintain its dividend, here's why. Adding to the uncertainty, ConocoPhillips reported a $179 million net loss last quarter, compared with a $2.1 billion profit in the same quarter last year. But ConocoPhillips management got out in front of this panic and put the issue to bed. In fact, Chief Executive Officer Ryan Lance immediately addressed the dividend in the last quarterly conference call by saying: "So let me give you the punch line of these comments: The dividend is safe. Let me repeat that. The dividend is safe." To me, it's a great sign that ConocoPhillips management has specifically mentioned the dividend in its communications with analysts. ConocoPhillips increased its dividend by 1% in July, and I don't believe the company would have done that if it weren't extremely confident it could sustain its payout, even under such adverse circumstances. Lance went on to provide several reasons for why the dividend is safe. It's also worth noting that ConocoPhillips hasn't cut its dividend in more than 25 years, a remarkable track record of resilient payouts, through many periods of falling commodity prices. First, ConocoPhillips is significantly cutting costs. Last quarter, ConocoPhillips cut operating costs by 11% year over year. The company announced a further reduction in full-year spending targets. It now plans to utilize $11 billion in capital expenditures this year, down from its prior forecast for $11.5 billion. Consider that before the crash in oil prices, ConocoPhillips had planned to spend $16 billion, so this is clearly a meaningful reduction. Second, ConocoPhillips is increasing production. Last quarter, total production grew 4% year over year, excluding the company's divestitures and operations in Libya. This growth was due to ConocoPhillips' shift to higher-margin liquids production. Going forward, management believes it can reduce spending even further and still achieve modest production growth, proof of the company's laser-like focus on efficiency and maximizing assets. Furthermore, on the subject of divestitures, the company sold $600 million of assets during the first half of the year. ConocoPhillips believes it can pursue about $1 billion of asset sales annually and not jeopardize its long-term growth priorities. It will do so by selling off non-core assets that aren't critical to the company's future. The result of all these initiatives is that the company expects to become free cash flow-neutral by 2017 and beyond, even in an environment of $60 Brent crude. On an earnings basis, ConocoPhillips' trailing 12 month EPS of $4.02 still covers its $2.96 per-share payout. The key takeaway is that while it's discouraging to see stock prices continuing to drop, the best-in-class Big Oil stocks should continue to pay their dividends. ConocoPhillips has taken it on the chin over the past year, but its nearly 6% dividend, at the very least, pays investors well to wait for a recovery in commodity prices. It's very likely ConocoPhillips will be able to maintain its dividend for the foreseeable future, even at low oil prices.